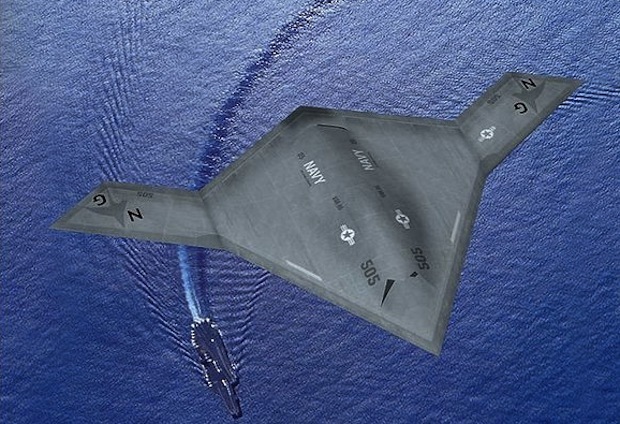 With its maiden voyage, the military’s X-47B suggests that remote-piloted, stealthy, deadly combat flying is the future. The next generation of Top Guns may be gamer geeks. That’s because the X-47B just took its very first flight, heralding a whole new era of military flying–automatic or remote-piloted, stealthy, deadly combat aircraft. Technically the X-47B is an unmanned combat air vehicle (UCAV), but what it really is is an evolution of those Global Hawk and Predator drone aircraft that made the Iraq War look like a computer game when viewed at the military’s tech hubs, mixed in with the same kind of stealth technology that makes the B-2 Spirit bomber such a powerful, frightening tool of force projection. Borrowing from decades of flying wing research, the X-47B is a sleek flying wedge of engines and electronics that’s all but invisible to radar, and hard to lock on to with infrared missiles. It’s capable of taking off automatically, flying to a location by itself, scanning the scene with a variety of sensors, and then–when commanded to do so by remote pilots–dropping precision-guided weapons on a target, before flying home to an air base or an aircraft carrier. Essentially this is the first of the successors to the revolutionary F-35, taking to the air as a prototype before the F-35 is even in service, because the X-47B is likely to be the model for future military aircraft, due to one crucial fact: Fragile human pilots are no longer needed. During combat, the loss of a military aircraft is a technological and fiscal blow, but the loss of a pilot is far worse–personally it’s a loss, politically it’s terrible, and financially it’s a disaster, since pilots cost millions of dollars to train and keep flight-ready. Human pilots also require life support systems in aircraft, which increases their weight, and limits their flight envelope–without the pilot aboard, an X-47B-type aircraft could theoretically perform all sorts of crazy aerobatic maneuvers that a human pilot couldn’t withstand. It’s this brave new future of flight that Northrop is now about to explore with further flight tests, culminating in carrier-landings. Check out the first flight video below, and you may want to mentally overdub the theme tune to Top Gun. Because in the future, the digital brains inside this sort of aircraft will take over from Maverick and Ice Man.